When the PN junction is forward biased, electrons are forced into the N region by the external source, and holes are forced into the P region. 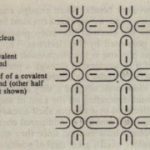 As free electrons move toward the junction through the N material, a corresponding number of holes progresses through the P material. Thus, current in each region is the result of majority carrier flow. Electrons diffuse through the depletion region and recombine with holes in the P material. 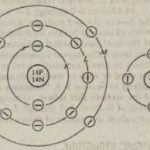 For each hole ~h~t recombines with an electron, an electron from a covalent bond leaves the P region and enters the positive terminal of the external source thus maintaining the equality of current entering and leaving the source. Since there is a reduction in the electric field barrier at the forward-biased junction. there is a corresponding reduction in the quantity of ionized accept or and donor atoms required to maintain the field. As a result, the depletion region narrows under forward bias. It might be supposed q~al the forward-biasing voltage V could be increased to the point that the barrier Held would be completely overcome. and .in fact reversed in direction. This is not, however, the case. As the forward-biasing voltage is increased, the corresponding increase in current causes a Jarger voltage drop across the P and N material outside the depletion region, and the barrier field can never shrink to O. Recall that the unbiased PN junction has a component of drift current consisting of minority carriers that cross the junction from the P to the N side. We discussed the fact that this reverse current is the direct result of the. electric field across the depletion region. Since a reverse-biasing voltage increases the magnitude of that field. we can expect the reverse current to increase correspondingly. This is indeed the case. However. since the current is due to the flow of minority carriers only. its magnitude is very much smaller than the current that flows under forward bias (the forward current). It is this distinction between the ways a PN junction reacts to bias voltage-very little current flow when it is reverse biased ard substantial current flow when it is forward biased-that makes it a very useful device in ·many circuit applications. In one of the most common applications, a single PN junction is fitted with a suitable enclosure, through which conducting terminals are brought out so that electrical connections can be made to the P and N sides. This device is called a (discrete) diode. The P side of the diode is called its anode and the N side is called its cathode. Figure 2-13(a) shows the standard symbol for a PN junction diode. Figure 2-13(b) shows the diode connected to an external source for forward biasing, and 2-13( c) shows reverse biasing. Diode circuits will be studied in detail in Chapter 3. From the standpoint of plotting the I-versus- V relationship in a PN junction, the sign convention makes further good sense. If forward current is treated as positive (upward), then reverse current should appear below the horizontal axis, i.e., downward, or negative. Similarly, forward voltage is plotted to the right of 0 and reverse voltage is plotted to the left of 0, i.e., in a negative direction. Figure 2-14 shows a plot of I versus V in which this convention is observed. Note that the current scale is exaggerated in the negative direction, since the magnitude of the reverse current is so very much smaller than that of the forward current. Equation 2-15 shows that the reverse current in the junction under these conditions is essentially equal to In the saturation current. This result accounts for the name saturation current: The reverse current predicted by the equation never exceeds the magnitude of . Equation 2-14 is called the ideal diode equation. In real diodes, the reverse current can, in fact, exceed the magnitude of Is. 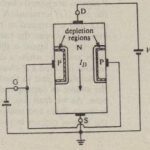 One reason for this deviation from theory is the existence of leakage current, current that flows along the surface of the diode and that obeys an Ohm’s law relationship, not accounted for in equation 2-14. In a typical silicon diode having Is = 10″14 A, the leakage current may be as t great as 10-9 A, or 100,000 times the theoretical saturation value. where II is a constant determined by experiment and has a value between 2 and 6. Certain special kinds of diodes, called zener diodes. arc designed for Lise in the breakdown region. The essentially vertical characteristic in the breakdown region means that the voltage across the diode remains constant in that region, independent of the (reverse) current that flows through it. This property is useful in many applications where the zener diode serves as avorage reference. 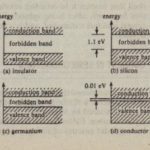 similar to an ideal voltage source. Zener diodes arc more heavily doped than ordinary diodes, and they have narrower depletion regions and smaller breakdown voltages, The breakdown mechanism in zener diodes having breakdown voltages less than about 5 V.differs from the avalanching process described earlier. In these cases. the very high electric field intensity across the narrow depletion region directly forces carriers out of their bonds. i.e .. strips them loose. Breakdown occurs by avalanching in zener diodes having. breakdown voltages greater than about 8 V. and it occurs by a cobination of the two mechanisms when the breakdown voltage is between 5 V and H V. The characteristics and special properties of zener diodes arc discussed, in detail in Chapter 17.
where V is the voltage across the device and I is the current through it. At the onset of breakdown, both V (a value near VII/I) and I (the reverse current) are liable to be large, so the power computed by equation 2-17 may weJI exceed the device’s ability to dissipate heat. The value of the breakdown voltage depends on doping and other physical characteristics that are controlled in manufacturing. Depending on these factors, ordinary diodes may have breakdown voltages ranging from 10 or 20 V to hundreds of volts. Use SPICE to obtain a plot of diode current versus diode voltage for a forward- SPICE biasing voltage that ranges from 0.6 V through 0.7 V in 5-mV steps. The diode has saturatiori current 0.01 pA and emission coefficient 1.0.
specifics the saturation current, IS, and emission coefficient, N, the values used arc the same as the default values so these could have been omitted from the statement. The .DC statement causes VI to be stepped from 0.6 V through 0.7 V in 5-mV increments. Figure 2-17(b) shows the resulting plot. (Portions of the complete printout produced by SPICE have been omitted to conserve space.) The plot has values of diode current, I(VDUM), scaled along the horizontal axis, and diode voltage, VI, along the vertical axis, By rotating the plot 90° counterclockwise, we see the conventional portrayal of current versus voltage, similar to that in Figure 2-11. Note that the forword current ranges from 0.1188 mA to 5.676 mA as the forward voltage ranges from fl.6 V to 0.7 V.
This input file is written in lowercase letters for illustrative purposes but PSpice unlike the original Berkeley SPICE, does not distinguish between Icwercase and uppercase letters. so either (or both) could have been used.